One issue which many dog owners will be familiar with is that of tear staining. It’s most commonly seen in dogs that have white or light coloured fur, and some breeds are more prone to it than others. Tear staining is the brown or reddish discolouration of the fur around the dog’s eyes. It is caused by epiphora, which is a condition that causes excessive production of and flow of tears or poor tear drainage. It is more common in certain breeds including Maltese, Poodles, and Shih Tzus. Acute or chronic in nature, it can also affect cats. 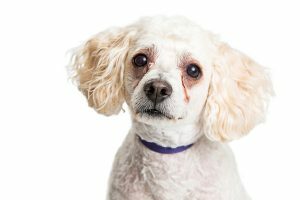 In many dogs, tear staining is an unsightly but benign occurrence; however it can represent a more serious problem with the health of your dog’s eyes. The reddish-brown staining from epiphora is caused by normal molecules in the tears that contain iron from the waste of red blood cell breakdown. Usually these waste products are removed in the faeces, but they can also be eliminated via tears. These stains become worse when exposed to sunlight. “Normal” tear stains are a rust colour with no bad odour. Brown stains are more likely a sign that a yeast infection has developed – and they may also be smelly. How do I Deal with Tear Staining? You need to consult a vet for a proper diagnosis of tear staining. Treatment may be very simple, from flushing or bathing the eyes to trimming the fur around the eyes. It may be more complex, requiring medication or even surgery. Without proper diagnosis and treatment, constant moisture in the eye area is not only unsightly; it can be uncomfortable for your dog. Your dog may develop a yeast or bacterial infection due to the moist environment, and these can cause itching, pain, and further damage to the eyes. Some dogs will suffer from tear staining intermittently. Keep your pet’s face clean and wipe tear moisture away gently twice daily with a soft, warm, damp but not wet cloth. Some pets with tear stains are very healthy; others are very unwell and the tear staining can be a sign of this. Your vet can make recommendations appropriate for your dog’s unique circumstances. There are tear stain removal products available, as well as supplements which can help.